Vitaly Beckman in Vitaly: An Evening of Wonders. Photo by Jeremy Daniel. BOTTOM LINE: The endearing Vitaly Beckman has a cheesy flare for the dramatic, which works against his incredible talent as an illusionist. Vitaly Beckman is a talented illusionist who performs typical illusions. His specialty is bringing the two-dimensional to life with a heavy focus on visual art. A self-described artist, Beckman spends a large amount of time making drawings of flowers and leaves come to life in front of the audience, or coloring black and white pictures using only his hands. While his technique is incredibly precise, the illusions are often only mildly interesting. Many of his card tricks have been performed by others for years, and lack the originality and personal touch that might differentiate him from other illusionists. That said, he performs these tricks beautifully and has truly mastered the art of slight-of-hand. The key difference in Beckman's show is his personality. More endearing than charismatic, Beckman appears to be having the time of his life onstage. He puts such care into each and every illusion that the love for his art is immediately apparent—at times, his melodramatic enthusiasm draws the eye more than the illusions themselves. Beckman also adds an incredible amount of cheese and "dramatic flair" to his act—witness the overly dramatic orchestral music, and his choice to use photos of himself through the years. An Evening of Wonders, which doesn't have a director credited, also draws out certain segments unnecessarily—like when Beckman blindfolds himself—taking away from the overall effect of Beckman's act. The illusions are further overshadowed both by the incessant on-screen close-ups of Beckman's hands and body (presumably to let those in back see what he's doing), and by his frequent running into the audience for volunteers. While he seems kind, Beckman's rapport and attempts at humor feel forced; though he relies on the audience heavily, there doesn't seem to be any real connection. However, while many of his tricks are familiar, Beckman does have some noteworthy ones up his sleeve. In one segment, Beckman completely changes photographs and driver's licenses with just a wave of his hand. I have absolutely no idea how he does this, and the effect is quite stunning. 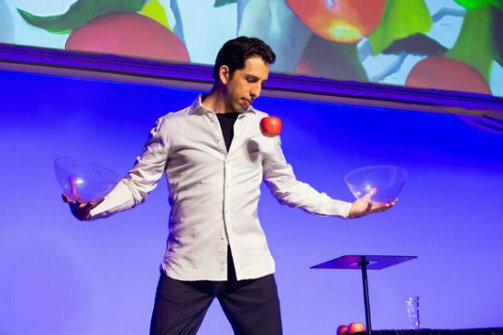 His skill at levitating various objects (mainly food and beverages) is also incredibly impressive and convincing. We know this levitation isn't "real," but his talent allows us to truly suspend our disbelief. For some, Beckman's talent will be enough; others, especially those versed in the art of illusion, may find the theatricality of Vitaly: An Evening of Wonders to leave something to be desired. Vitaly: An Evening of Wonders is created and performed by Vitaly Beckman. Co-written by Doug Bennett. Set Design by John Rios. Lighting Design by Stephen Bulat. Stage Manager is Aimee-Marie Holland.